The delivery of justice is a core function of the modern state. The recent introduction of jury/lay judge systems for criminal trials in Japan, South Korea, Spain, and perhaps soon Taiwan represents a potentially major reform of this core function, shifting decision making authority from professional judges to ordinary citizens. But the four countries chose to empower their citizens to markedly different degrees. Why? Who Judges? 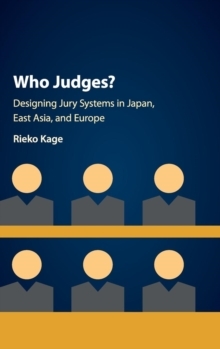 is the first book to offer a systematic account for why different countries design their new jury/lay judge systems in very different ways. Drawing on detailed theoretical analysis, original case studies, and content analysis of fifty years of Japanese parliamentary debates, the book reveals that the relative power of 'new left'-oriented political parties explains the different magnitudes of reform in the four countries. Rieko Kage's vital new study opens up an exciting new area of research for comparative politics and socio-legal studies.